Some of the most serious questions that SOCO International has to answer relate to allegations that its representatives and allies used threats and physical violence against opponents of the company’s operations in Virunga. There have been worrying reports from credible and respected local organisations since at least 2012 of SOCO International allies orchestrating a campaign of intimidation against local anti-oil activists…. As per the UN guiding principles on business and human rights, I ask the Minister whether and in what capacity the UK’s diplomatic missions in the region will support the human rights and civil society activists who are trying to defend the park’s protected status. What have the field offices done thus far to support civil society activists, and does the FCO feel it has done enough? Those guidelines say that states must take responsibility for the actions of companies domiciled within their jurisdictions. What can the UK Government do to ensure that SOCO International is conforming to these guiding principles, and what sanctions can they impose if they find that SOCO International, its representatives or allies have committed human rights abuses? A leader of a cross-party anti-corruption group of British MPs yesterday called for UK and US authorities to investigate claims that Soco International, a London-listed oil company, may have breached anti-corruption legislation in the course of its work in Africa’s oldest national park in the Democratic Republic of Congo. Analysis by Global Witness, based in part on undercover footage shot by the makers of the Oscar-nominated ‘Virunga’ documentary, showed that Soco and its contractors have made illicit payments, appear to have paid off armed rebels and talked dismissively about the ecosystem of Virunga National Park. Soco’s oil block overlaps with Virunga, a UNESCO World Heritage site in eastern Congo that is home to around a quarter of world’s remaining mountain gorillas. Soco denies the allegations made against it in the documentary and in Global Witness’ report, Drillers in the Mist, saying in June 2014: “the Company operates in accordance with the Bribery Act 2010 and any allegation to the contrary is categorically denied.” It added: “[p]ayments to rebel groups have never been nor will ever be sanctioned by Soco”. Munt explained that Soco’s American executive directors are employed by a Delaware-registered subsidiary. As a result, she said, “these individuals fall within the jurisdiction of the United States, and there seems to be a case to be made that Soco International, under their stewardship, has breached the terms of America’s Foreign Corrupt Practices Act.” Anas Sarwar MP, co-chair of the anti-corruption group, also raised concerns about the involvement of offshore companies in Soco’s corporate structure. David Lidington MP, a Foreign Office Minister responding on behalf of the government, said that the UK’s Serious Fraud Office was aware of allegations against Soco and that he would look into the channels for exchanging information with US authorities. 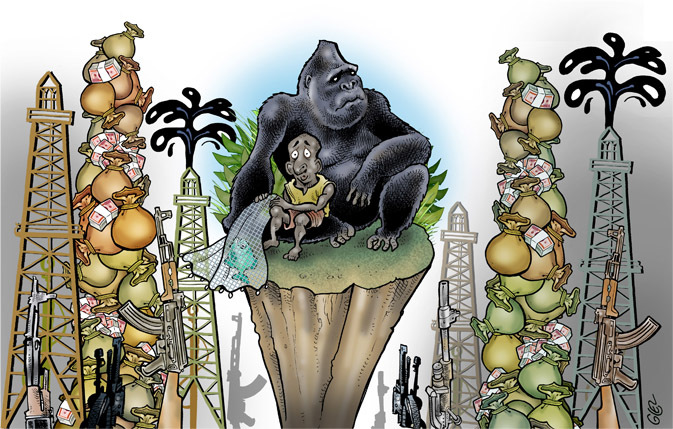 “The government’s long-standing position has been and remains to oppose all oil exploration in Virunga National Park,” said Lidington, before adding that the UK would object to “any attempt by Soco to seek the redrawing of the boundaries of Virunga”. The government supports an alternative economic vision for Virunga based on fisheries, ecotourism and hydropower, he added. The comments and questions by MPs add to mounting pressure from Soco’s own shareholders for the company to launch an independent investigation into the behaviour of its employees, contractors and representatives in Virunga. On 8th February 2015, the Church of England, which holds £3 million in Soco shares, issued a statement demanding a “wide ranging and transparent independent enquiry of Soco’s operations in and around Virunga National Park”. The Church also demanded that Soco amend a 2014 joint statement with WWFso that Soco commits unambiguously not to explore for oil within the current boundaries of the park. Human Rights Watch published a report on 4 June 2014 (“DR Congo: investigate attacks on oil project critics”) which contained much detail about allegations of human rights violations by supporters of Soco and of bribery, and Soco’s response to these allegations has been posted online.